When Mohammad Tazim, First Year Medical Student in the College of Medicine entered the BMG Safe Drive Life Saving competition in April this year, little did he know he would become the proud second prize winner of an experience never to be forgotten. 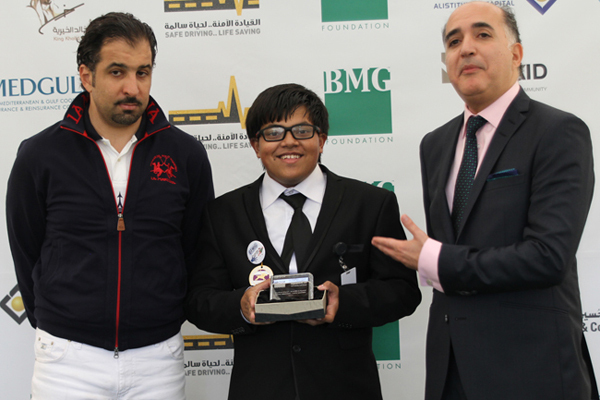 The competition formed part of the Safe Drive Life Saving Campaign launched in February 2014 by BMG Foundation, (President Mr Basil Al Ghalayini). Competitors were asked to design an advertisement to educate and raise public awareness for the need for safer driving, not only in Riyadh, KSA but in the wider Gulf countries This initiative was in response to the rising numbers of road traffic accidents touching peoples’ lives on a daily basis. Mohammad Tazim was awarded second prize. The Awards Ceremony which took place in London, UK, provided prize winners with an opportunity to attend an exciting polo match between HRH Prince William Duke of Cambridge and HRH Prince Harry – Prince of Wales. Mohammad personally met both the Princes from the British Royal Family and was lucky enough to exchange a few words with them. Through Mohammad’s efforts, together with other winners and competitors the Safer Driving Campaign can achieve its ultimate aim, to reduce the numbers of road traffic accidents locally, nationally and internationally. Congratulations Mohammad for your hard work as an active member of Gulf Family Medicine Interest Group (GFMIG) and dedication to this cause. We are proud to have you as an Alfaisal student.